"This is Kodi. 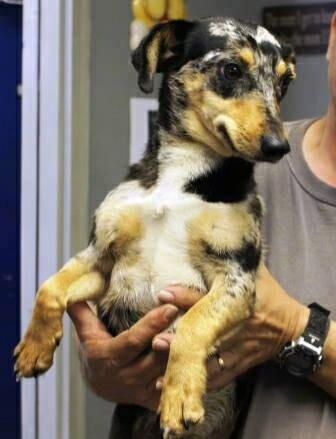 He is a Dachshund / Pembroke Welsh Corgi mix. He loves to chase rabbits and birds and is very loyal and loveable. His long ears stick straight up from his head and he has a white belly like a Corgi." The Dorgi is not a purebred dog. 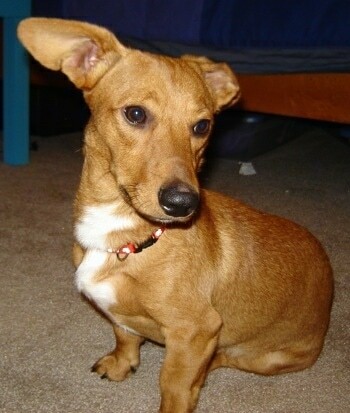 It is a cross between the Dachshund and the Corgi. The best way to determine the temperament of a mixed breed is to look up all breeds in the cross and know you can get any combination of any of the characteristics found in either breed. Not all of these designer hybrid dogs being bred are 50% purebred to 50% purebred. It is very common for breeders to breed multi-generation crosses. 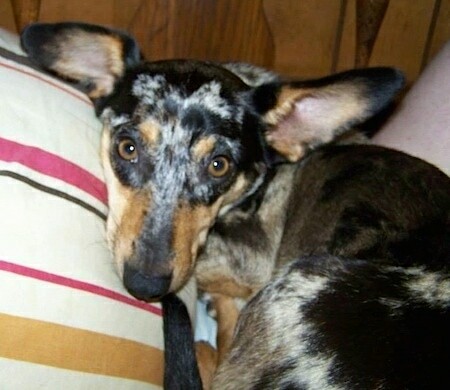 Ozzy the merle Dorgi at 2 years old—"Ozzy is a 2-year-old Dorgi or Dachshund / Cardigan Welsh Corgi mix. We rescued him from the local county animal shelter where I volunteer. He had been at the shelter for several months and had gone to 5 mobile adoption events with no luck. When we were packing up at the end of the 5th one I told him that if I saw him at the next one, he'd be coming home with me. Of course, there he was waiting in a crate in the shelter's van at the next event and he came home with me! Ozzy is such a sweetheart and a total lover. He loves everyone he meets and is extremely social. I am also training him to be my Post Traumatic Stress Disorder (PTSD) service dog and he goes with me everywhere. I couldn't have asked for a better dog!!" 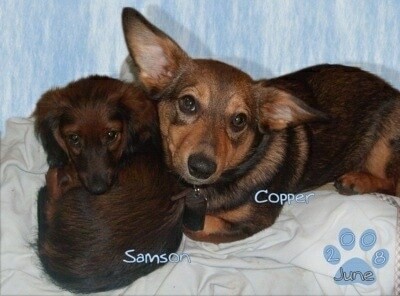 "Copper is 6 months old in this photo and he is a Dorgi. His dad was a pure Corgi and his mother was a pure longhaired Mini Dachshund. He weighs 13 pounds. I don’t expect him to get much larger. "His little sidekick in the photo is Samson, a purebred longhaired Mini Doxie that was going to be put to sleep or given to a shelter, and we couldn't have that. "Copper is very full of energy, but not destructive at all, and he has some of the Dachshund traits in that he is very much a free thinker. He’s got a lot of “common sense.” He doesn't want you angry at him, but once he’s set his mind on something, it is very hard to get him away from it. He does have a tendency to “follow his nose” so we can’t ever let him off his leash. "We have 2 acres and for the majority of the day they are out of their crates and frolic around the office on the property or out in the backyard. Once they are worn out, they take a nap in their crates for about 2-3 hours. They like to be crated together, so we do have a big crate we can put them in and we call it “cage fighting;” they just wrestle and play and wear themselves down! When it’s quiet time, though, they are crated separately. "After watching a couple of episodes of the Dog Whisperer, I did use one of the techniques, and found that Copper actually did respond well. Where Cesar often puts 2 fingers on the dog’s neck to ‘snap its focus to you,’ I have found Copper responds to this and I was able to train him to follow “finger snaps.” So he knows if we are in the office, finger snaps mean lie on your pillow. And outside it means to go wait for me to finish taking the puppy potty. He’ll sit quietly while Samson and I wander about the yard. 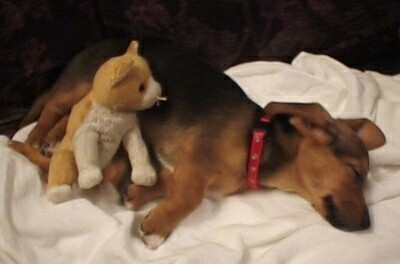 I was surprised in a way, but I think Copper understands now that I’m the boss, and he’s willing to be more compliant. I have to say, I would not have considered myself a dog person, but this Dorgi is a very good mix and I really think people will enjoy them!" "This is my "Designer Dog," Daisy. In these pictures, she is 10 weeks old. 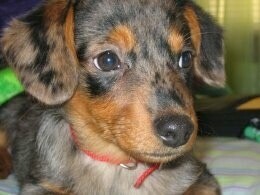 Her mommy is a full-blooded Corgi, and her daddy is a full-blooded Dachshund." 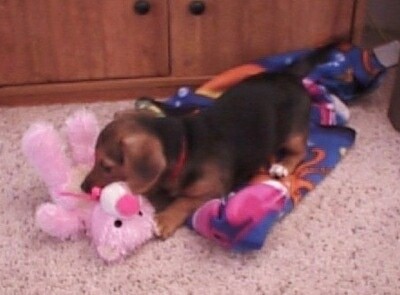 Daisy the Dorgi (Corgi / Dachshund mix breed) puppy at 10 weeks old chewing on her toys.